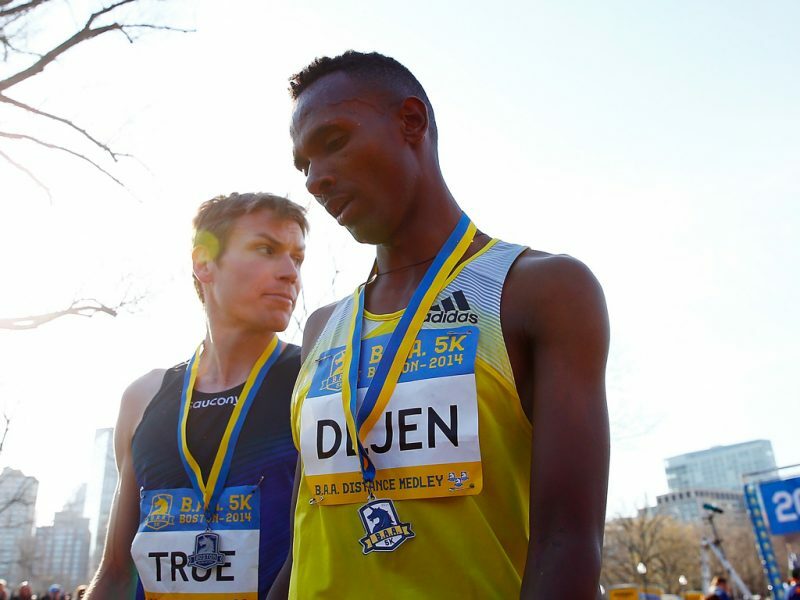 Ethiopia's Dejen Gebremeskel set a new men's course record of 13:26 to win, in a photo finish, his second consecutive title at the sixth annual B.A.A 5K in Boston on Saturday. Moments after the starting horn sounded, Gebremeskel, 24, bolted into the lead, taking control of the pace early on. As reigning champion, Gebremeskel was determined to claim yet another B.A.A 5K crown. Splitting one mile in 4:23, Gebremeskel was joined by Daniel Salel (KEN), Stephen Sambu (KEN), Lani Rutto (KEN), and Yarmouth, Maine native Ben True. The pack would remain together through mile two (8:49), crossing the Boston Marathon finish line on Boylston Street as one. Not until the final straight would a champion be determined. Gebremeskel, 2012 Olympic silver medalist at 5000m, turned to another gear on Charles Street, one that was only matched by two-time B.A.A. 5K champion True. True settled for second timed also at 13:26 with the 2013 B.A.A. 10K champion Stephen Sambu third in 13:27. 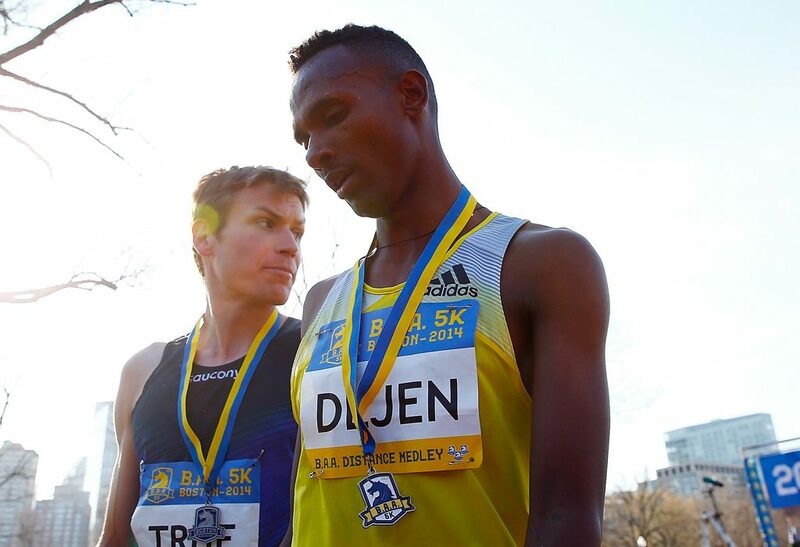 "I'm really glad, this Boston Marathon," said Gebremeskel, who earned $7,500 (USD) for finishing first and a $5,000 (USD) bonus for establishing a new event record time. "The town is talking about the Boston Marathon. It is like the whole town: Monday, Tuesday, Wednesday, Sunday, Monday, even today. I like this. It is a really big race." In the women's race, Molly Huddle, a 2012 Olympian, powered her way through the second half of the race, going on to win in 15:12. Her time ties the previous event record, set by Ethiopian Werknesh Kidane in 2012. The 2013 B.A.A. 10K champion Mamitu Daska from Ethiopia placed second in 15:14, while another Ethiopian Sentayehu Ejigu took third in 15:16. While Daska took the pace out hard early on, hitting the mile in 4:50, Huddle sat back and waited patiently. Finding herself in sixth place when crossing the Boston Marathon finish line with less than a mile to go, Huddle began to slowly gain on the field. Soon thereafter, she drew extra motivation from the tragic events of April 15, 2013. "I felt like everyone was cheering for us. With a half mile to go I thought it would be great for an American to win this race and so I think it gave me a little extra boost," she said. "Once the crowds were cheering and I was building momentum, I was able to pass the girls," said Huddle. "People were really rooting for the Americans out there." The B.A.A 5K is the first race of the B.A.A. Distance Medley, a three race series that includes the B.A.A 5K, B.A.A. 10K, and B.A.A. Half Marathon, presented by Dana-Farber Cancer Institute and the Jimmy Fund. Runners from around the nation and world came to Boston Common ready to race 3.1 miles through Boston's picturesque Back Bay neighborhood. In total, more than 8,600 runners finished the race, held two days prior to the 118th Boston Marathon.